Looking for suggestions for wedding entrance music, songs for signing the register, and other parts of the wedding ceremony? You can find lots of ideas for songs to walk down the aisle to, and many more, based on five years of weddings. For wedding music ideas, party songs and inspiration in choosing music for your ceremony, drinks reception and wedding breakfast, here is a list of music chosen by previous clients. 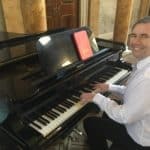 Simon Jordan is a UK pianist who will play any song and asks brides and grooms to make their own requests. No other UK musician for weddings is versatile enough to offer this service. Christina perri- A thousand years. Stevie Wonder- Isn’t she lovely. John Legend- All of Me. Walking back Down the aisle. Jackson 5- I want you back. Abba- winner takes it all.